How a few slits of carbon fiber turned one of the worst track cars ever into one of the best. There are two types of fast cars in this world, the ones that start out as solid everyday cars that then get huge performance additions, and the ones that are born as race cars and are given a thin veil of civility in order to squeeze past regulators. This is a story about the latter of the two, and arguably one of the best performance-per-dollar track specials that’s available. Like any good underdog story, the Dodge Viper ACR has its roots in humility. The original Viper wasn’t known for being driver friendly. In fact, it was downright rude. Gobs of horsepower kept the rear wheels from hooking up to the pavement and muscle car driving dynamics meant that lap times were dismal. The Viper was a mess, and that’s why in Europe the car remained trivial at best. The hottest automakers in Europe had just hit the world with cars like the Porsche 918 Spyder, which may as well have been a magic scalpel that allowed someone with basic first-aid training to do brain surgery. The Viper couldn’t have been more different. It was a bludgeon that was imprecise and easily misdirected its force. Using this as a base, Dodge got to work building a car that could topple the techno bastion of supercars that cost ten times as much as the lowly Viper. To do this, it exploited one area that held back the hybrid hypercar trinity: complication. Cars like the Porsche 918 need supercomputers to manage hundreds of variable settings in order to set lap records, but Dodge wanted to do so by using the simplest means available. Bits and pieces of carbon fiber were added to the car until it defeated one of its main enemies: lack of traction. Technology may be the highlight of the newest generation of hypercars, but the Dodge only has downforce to boast. Using a front splitter, dive planes, a carbon fiber rear diffuser, and a massive dual-element carbon fiber rear wing, the Viper ACR enlists even a light breeze to force feed its tires into the pavement. At 177 mph, the Viper makes 1,763-pounds of downforce, more than any production car in the world. Even at 150 mph, the ACR’s body is sending 1,201-pounds of air-derived mass to the tarmac. The current generation of hypercars have grip that makes it seem like there is cement on their tires, but the ACR may as well have anchors. With air running through its carbon fiber slits, 1.5 G of cornering ability is unlocked. Suddenly, the quintessential American supercar, the same one that ran away at the scent of a corner just a generation ago, could make the million dollar Porsche 918 look skittish in the bends. Straights however, are not the ACR’s forte even with an 8.4-liter V10 that makes 645 horsepower and outsizes a Bugatti Veyron’s engine. The downforce has its virtues on the track, but is so vast that it hinders the engine’s 600 lb-ft of torque, which is more than any other naturally aspirated production engine. 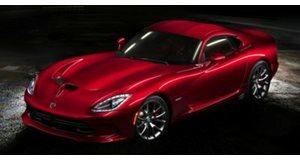 The standard Dodge Viper has a coefficient of drag of 0.37, but the Viper ACR hits 0.54, which is nearly as much as a Hummer H2’s 0.57. This serves to lower the top speed by 27 mph from 204 mph on the Viper SRT to 177 mph on the ACR. It has so much drag in fact that Ralph Gilles, head of design for FCA, found that his Jeep Grand Cherokee got a 2-mpg reduction in fuel economy when it was towing his personal Viper ACR instead of his Viper GTS. With downforce equivalent to the weight of 10 average-sized males standing on the car, the suspension has to be beefed up too. Plenty of negative camber is dialed in to compensate for the extra downforce and the Bilstein shocks used here are three times stiffer than the ones found on a regular Viper. Like the rest of the car, the shocks are highly adjustable. They have 10 settings for rebound and compression and are accompanied by ten fully adjustable or removable aero components that are scattered around the body. The hood louvers can be popped out to reduce air pressure in the wheel wells and the entire car can be raised or lowered three inches to offset driver weight and vary control changes that come from a low or full fuel tank. The fact of the matter is that most ACR buyers won’t know what to do with this car. It is a barley legal vehicle that could be taken to a GT3 race and fit right in, but at the same time it could also be a prized possession for a supercar lover. The Dodge 1 of 1 program with 25 million possible options for the ACR makes sure of that. Race car drivers will feel at home with the car’s ability and amateurs will get plenty of thrills, and at the end of the day, it's hard to make a case against a car that's as capable as a hypercar and costs only $118,795. It wasn’t long ago that the Corvette was the car to buy if you wanted cheap performance, but now it looks like the tables have turned. The Corvette may be the perfect Ferrari 488 GTB fighter, but the Dodge Viper ACR brings the playing field to the level of the Ferrari LaFerrari. Your move, world.